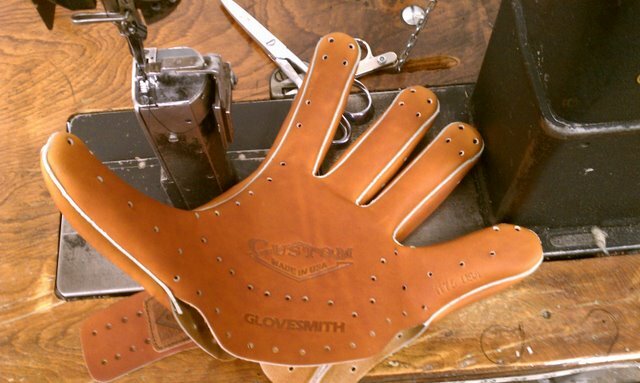 WWW.GLOVE-WORKS.COM BASEBALL GLOVE COLLECTOR FORUM • View topic - Bye Bye AMG175, AMG600, and AMG 650. Post subject: Bye Bye AMG175, AMG600, and AMG 650. So I took a Nokona tour the other day (90 minutes with Rob and four 13U baseball players). I got a copy of the 2015 catalog and I was surprised to find that the AMG175/WS1200, the AMG600.WS1250 and the AMG650/WS1300 are gone. There is a new 13" softball pattern, but it looks surprisingly like the WB1275H that they made for a year back in 2012. But instead of with the H web, it has a basket. I also tried on the new fastpitch gloves. Definitely a snug fit for my size L hands, but excepet for the Velcro and the fact that a TIP (two in pink) grip would be impossible, the 13" pattern especially was really nice. Post subject: Re: Bye Bye AMG175, AMG600, and AMG 650. Thanks for that update. Any other interesting things in the catalogue? There is a new leather called "Generation" which looks like a cross between banana tan and walnut. Sort of a rugged tan look. The Bloodlines are gone and the only black is the black kangaroo on the backside of the fastpitch line. Other than that, I think the elimination of three of the slowpitch patterns, including the end of the BM76 run, is the big change. so they've eliminated the entire Bloodline model series? baseball AND softball? That's a shame, I love m 12" baseball one. Easily one of my favorites. The demise of the AMG-175 means that I will enjoy having my new all buffalo and black cowhide gloves 175's all the more. I have five new Nokonas in my mini-collection, and none of them are still in production. Thanks for the update, Rous.